It's one of those March days where we're having one heckova of time concentrating. The Rochester Post Bulletin reports on the reason why: the March melt continues. We lost about a foot of snow yesterday. Our DNA makes us want to go out and tile a field. The DNR will be happy that we're defying biology and birding instead. Yesterday while running errands, we came across two tom turkeys strutting their stuff, and we must have seen two dozen very sassy pheasant roosters beside the road. The MOU is sending e-mail digests reporting spottings of sandhill cranes, bluebirds, red-winged blackbirds and herons returning to Southern Minnesota. A quick post, and we're out of here: policy discussions can wait until after dark. Two weeks ago, Goudy received a phone call that indicated the law he's been pushing for at least three years may finally be making headway. He said he was at a friends house when his cell phone rang, and it was a Washington, D.C. number. The call was from first-term U.S. Rep. Tim Walz, who represents southeastern Minnesota. Goudy said local state legislators have been supportive, but Walz' position as both a veteran and a member of the House Committee on Veterans' Affairs gives him a position to begin moving the proposal forward. “His thing was, ‘Where do we start? '” Goudy said. Paul Schmelzer has done a good job capturing the spirit of Sunday's forum about Darfur. A driving force for keeping this issue in the conscience of America has been the coalitions put together by young people. Back in 2005, Campus Progress reported on the 100 Days of Action campaign spearheaded by the Genocide Intervention Network. One of the interesting things about the organizing is that it draws people from across political divisions and faith communities. 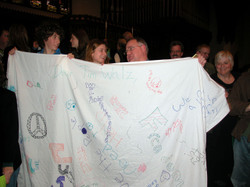 At the Forum, each legislator was given Darfur-related banners students put together for their offices. Although the corn-soybean rotation is one of the backbones of Midwest grain farming, we do grow other crops, including fruits and vegetables. The Green Giant was making peas, not war, pretty early on. The bipartisan Farming Flexibility Act of 2007 (H.R. 1371 - Farm Flex), introduced today in the House of Representatives by Reps. Tammy Baldwin (D-WI), Mike Pence (R-IN), Timothy Walz (D-MN), and Ray LaHood (R-IL), restores options to Midwest farmers and food processors now penalized by planting restrictions in the 2002 Farm Bill. Under the 2002 Farm bill, farmers who plant one of the big five commodity crops (corn, soybeans, wheat, cotton, and rice) automatically receive "direct payments" for planting those crops. These payments are directly proportional to a farm's base acres, which are a historical average of its planting history of a commodity. Under the 2002 Farm Bill, a farmer is not obligated to grow the crop to receive a direct payment for that crop, and may plant any crop except fruits and vegetables or no crop without losing these benefits. This is called "planting flexibility" - the ability to receive direct payments for a base crop (e.g., corn), but to grow a different crop on those base acres (e.g., soybeans). The "no fruits and vegetables" rule is a "planting restriction." Currently, farmers who choose to plant fruits and vegetables on their base acreage are doubly penalized for doing so in that 1) they will not receive the direct payments on those base acres on which they plant the fruits and vegetables, and 2) they must pay an additional financial penalty based on the market value of the fruits and vegetables they plant. As a result, most producers cannot reduce their reliance on the farm commodity programs by rotating vegetable production onto their land and pursuing canning contracts. Consequently, processors have experienced inadequate supplies of fruits and vegetables for canning. Farm Flex removes the planting restriction on fruits and vegetables. While producers who choose to plant fruits and vegetables on base acres would not receive direct commodity payments for that acreage, neither would they have to pay an additional penalty. In addition, their historical record of base acreage would not change. "Farm Flex is a long overdue correction that benefits both family farmers and food processors in the Midwest," said Congresswoman Baldwin. "We can support and encourage family farming by expanding a farmer's planting choices. We can maintain a robust economy by facilitating a cooperative relationship between producers and processors. We can do both by lifting the existing unnecessary limits and penalties," said Baldwin. "The Farm Flex Act will provide Hoosier farmers freedom and flexibility to plant fruits and vegetables that they do not have under current law. Passage of this bill is vital to helping Indiana farmers stay competitive in the global marketplace as well as saving the taxpayers money," said Congressman Pence. "Not only will Farm Flex benefit producers who grow fruits and vegetables under contract by removing penalties for growing those crops, but it will also help reduce farm program payments for the acreage planted in fruits and vegetables," said Congressman Walz. "This legislation is a win for the American taxpayers and a win for farmers who want to plant more diverse crops," Walz said. The Farm Flex bill, supported by a coalition of food processors and family farmers, is consistent with free market principles, improves World Trade Organization (WTO) compliance, and would actually result in significant cost savings for the federal government. "We provide delicious vegetables - sweet corn, green beans, peas, and more - to families year round," said Jeff Griep, a spokesperson from Lakeside Foods, a processor employing 1700 people in Wisconsin and Minnesota. "These vegetables are grown on farms in Wisconsin and throughout the Midwest. Without a change in these restrictions, our costs will keep going up, making it even more difficult to compete with imports," Griep said. Ray Utterback, a grower in Elwood, Indiana said, "My family grows soybeans and corn, rotating the crops to nourish the land. We sell our vegetables to processors, who then provide canned and frozen vegetables to grocery stores around the country. Family farmers in Indiana and throughout the Midwest appreciate this commitment to helping us stay on our land." FARM FLEX would allow fruit and vegetable (FAV) production for processing on unsubsidized program acres without jeopardizing the farm's base acreage (acres eligible for enrollment in future government farm programs). WTO COMPLIANCE -- Farm Flex would improve WTO compliance. FAV restrictions were a basis for the US loss of the WTO cotton case, as well as a pending action by Canada against the US. USDA has proposed complete elimination of FAV restrictions to improve WTO compliance and better protect U.S. farm exports from retaliatory tariffs. NO SUBSIDY, SAVES MONEY -- Farm Flex would reduce the farm's program payments for the acreage planted in FAVs. No farm program subsidy would be paid on Farm Flex FAV acreage. CBO has scored Farm Flex as a budget reduction. BETTER PROTECTION FOR FRESH -- Farm Flex pertains ONLY to FAVs under contract for processing. Farm Flex production would not enter fresh markets. Farm Flex would increase protection of fresh markets from Midwest FAV production. LIMITED IMPACT -- The current FAV restrictions and Farm Flex affect only Midwest farms, where nearly all productive land is enrolled in a farm program, the double crop exemption is not relevant, and farm and producer histories are inadequate. FIGHT RISING IMPORTS -- Farm Flex would free American farmers to compete with canned food imports. Current FAV restrictions have helped canned food imports rise since the '02 Farm Bill, despite a weakened US dollar. DESIRABLE CROP ROTATIONS - Farm Flex would relieve current FAV restrictions that sharply curtail crop rotation opportunities, contrary to good agricultural practices. · Current producer history production allowances are not transferable. Surviving spouses and children struggling to continue the family farm operation are denied FAV producer history. As FAV farmers with producer history retire or pass on, their producer history is lost. · Most acres farmed by Midwest family farmers are rented. Fear of losing base acreage has caused many Midwest landlords to prohibit FAV production. The base acreage recalculation after the 2002 Farm Bill cut base acreage due to FAV production. · Current FAV restrictions undermine the competitiveness of FAV processors, the market for Midwest family farm FAV production. · Young farmers seeking diversification into FAV production are prevented from starting FAV production, even though FAV production acreage has been declining.